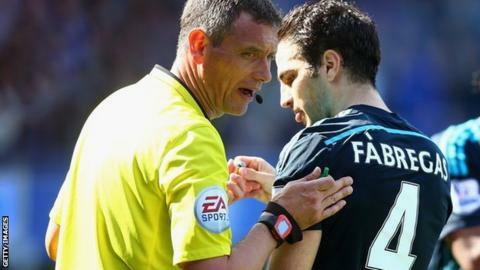 Jose Mourinho refused to condemn the QPR supporters who threw missiles at his Chelsea players after Cesc Fabregas's late strike at Loftus Road. As Fabregas and his team-mates celebrated the 88th-minute winner, coins and plastic bottles were among objects thrown from the home stands. Defender Branislav Ivanovic grabbed his neck in pain after being hit. "The game was correct in the pitch and correct in the stands," said Mourinho. "It is not easy in an emotional game." The Chelsea boss added: "If, at the end of the game, someone threw a pound coin, put it in your pocket. If someone threw a chocolate, eat it. It is no problem. Everybody needs a pound." QPR manager Chris Ramsey did condemn those involved in the incident, claiming rivalries can "sometimes go too far". He said: "We don't want objects thrown on the pitch. "I don't know what happened and I didn't see it, but if that's the case [that objects were thrown] we don't want those people back in the club." The 1-0 victory took Chelsea seven points clear of second-placed Arsenal at the top of the Premier League, with a game in hand.